A country famed for its canal-side cafés, futuristic architecture, and a fashion that bridges the gap between the vintage and the contemporary glamour industry, visiting the Netherlands is definitely worth it, despite the stringent Netherlands Visa Requirements. But, don’t worry about the visa application process, as this article can guide you through every step you require from filling up your visa application form to appearing for the visa interview! To obtain the Netherlands Schengen visa, the first thing you need to do is, choose the visa type. Since there are plenty of options like tourist visa, business visa, student visa and job visa, it is necessary that you may be specific about the purpose of your visit. 1. A duly filled visa application form: The visa application form for Netherlands visa can be filled electronically or get the printed application form and fill it using a blue ink pen. The form can be downloaded from the Netherlands Official website. Here’s the link to the application form. Once filled, you need to print it and duly sign the form. 2. Two passport-sized photographs: You should present two passport-sized photographs with your whole face coverage. Since the photographs are to be affixed along with the application, it must fulfil all the visa photo requirements and specifications. 3. 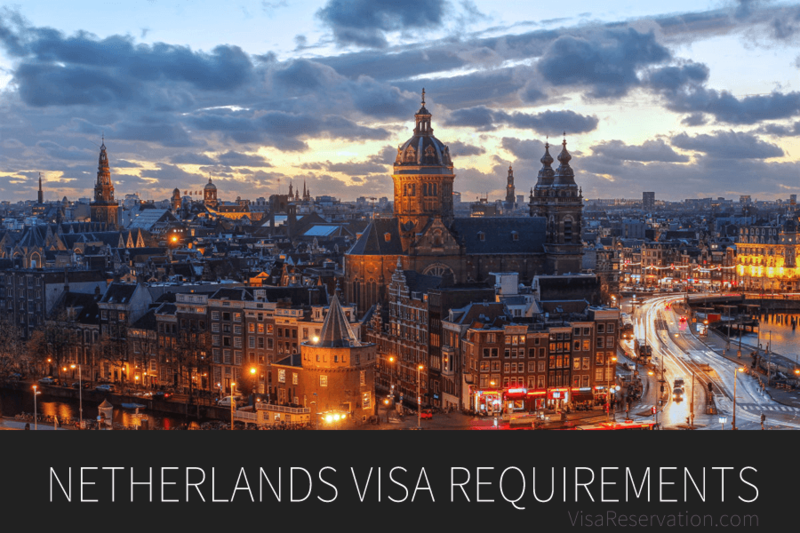 A valid passport is an important document among the Netherlands visa requirements. Make sure that it is valid for at least till 3 months after your return date. There should be a minimum of 2 blank pages for the arrival and exit to be recorded. You may also be requested to provide the photocopies of all your previous passports, if applicable. 4. Flight reservation for visa: You need to produce your return flight ticket as an assurance that you will be returning to your native country. You need not purchase a return ticket before obtaining the visa. Instead, you can just get a flight itinerary from your travel agency. Note that it should have the dates and flight numbers specifying the entry and exit from Netherlands. 5. Covering Letter: A covering letter mentioning the essential details about your trip is among the mandatory Netherlands visa requirements. It should include the purpose of your visit, the places you will visit, your accommodation, as well as means of transportation. In case it is a business tour, you need to provide the invitation letter from the Dutch company, with its address and contact details, as your proof of accommodation. 6. Hotel reservation for visa: You need to provide the hotel reservation receipts to prove that you’ve made all the necessary arrangements for your stay in Netherlands. It can also be an invitation letter, with the address and phone number of a friend, relative or even a sponsor inviting you to stay at their residence during the trip. 7. Travel Insurance policy: A travel medical insurance is an inevitable document among the Netherlands visa requirements. It is the proof that you have all the means to afford any emergency in Netherlands. The insurance must have a coverage of 30,000 EUR or more, and should also be applicable to all the Schengen area countries. Even when you have all these certificates ready, there are chances that your Immigration officer may ask for some supporting documents. So, in order to prevent any last-minute hassle, you can be ready with these additional documents, along with the mandatory ones. One of the most common supporting document that is regularly asked is the proof of your civil status. You can provide your marriage certificate, ration card, spouse’s death certificate if you’re married. If you’re unmarried, your birth certificate should suffice. The address proof of your permanent residence, as well as the No Objection Letter, are very important to show that you have some important responsibilities in your home country and that you’ll be returning back home after the trip. If you’re a salaried employee, a No objection letter from the employer is required. If you’re a student, you can get the NOC from your school/university. Proofs of sufficient financial means are also important for the Dutch government to ensure that you can pay for all the expenses during your stay in Netherlands. Acceptable proofs showing your means of sustenance include your bank statement for the last 3 months, duly signed and sealed from your bank, as well as your Income Tax Returns certificates for the past two years. If you’re a student, the proof of enrolment and the certificates of all the courses completed or attended should be given along with other documents. For applying for a visa for medical purposes, it is necessary that you provide the sufficient medical reports from a registered hospital in your native country. Once you’ve collected all these documents, you can lodge your application at the Netherlands Embassy/Consulate or the Netherland visa application centre in your home country. You can slip all these documents into a long brown envelope with your name and contact number in the upper left corner. Before enclosing all the Netherlands visa requirements, don’t forget to recheck that you have provided all necessary documents. If you fail to provide any of the important Netherlands visa requirements, it may end in getting your visa refused or delayed. We understand that the visa paperwork is, undoubtedly, dull and tiring, but with the right guidance, you can crack the visa application process without any hassle. That’s why, if you need any sort of assistance with the Netherlands Visa requirements, such as getting a hotel reservation for visa or a dummy flight reservation, you can simply contact us for help. We can definitely guide you through each and every step of applying for your visa to the Netherlands! Thanks for reaching out. Documentation to show your purpose of visit such as Tourism, Visiting family or friends, Business, Attending conferences, Trade shows etc in the form of invitation letter from the respective parties and travel itinerary, proof of accommodation should be provided to make your case stronger.